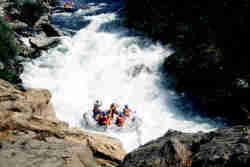 The Goodwin Canyon section of the Lower Stanislaus River is one of the closest class IV whitewater rafting runs to the San Francisco Bay Area. Small portions of this web site were referenced from California Whitewater by Jim Cassady and Fryar Calhoun. For more information about how to order this California whitewater rafting guidebook, visit the about the website page. Whitewater rafting started here after the Upper Main Stanislaus (Camp 9 section) was flooded by the New Melones Dam. Goodwin Canyon is a short whitewater rafting run with only a few class IV rapids, but the surprisingly scenic beauty and easy access make this a good choice for a half-day or one-day trip. This is an advanced river with some extreme hazards. The mile-by-mile guide describes the most difficult rapids, the hazards of each and the portage routes. It is not uncommon to portage one or all three major rapids. The access to take-out and put-in are easily accessible off of Highway 108/120, about 15 miles east of Oakdale. Whitewater rafting permits for private boaters are not necessary, however camping permits are required. Goodwin Canyon is an advanced level of difficulty, and requires experience and good river running skills. If you want to tackle this run on your own, you may want to consider contacting a commercial whitewater rafting outfitter.